"Our Quantum droplets are in the gas phase but they still drop like a rock," explains experimental physicist Francesca Ferlaino when talking about the fascinating experiment. In the laboratory, her team observed how macrodroplets formed in a quantum gas. The scientists were surprised to find that the quantum droplets were held together almost without external intervention and solely by quantum effects. This discovery by the research team in Innsbruck, and a similar work carried out simultaneously by a research group from the University of Stuttgart working with the magnetic element dysprosium, opens up a completely new research area in the field of ultracold quantum gases. In their experiment the researchers produced a Bose-Einstein condensate of erbium atoms at extremely low temperatures in a vacuum chamber. They then controlled the particle interaction by using an external magnetic field. 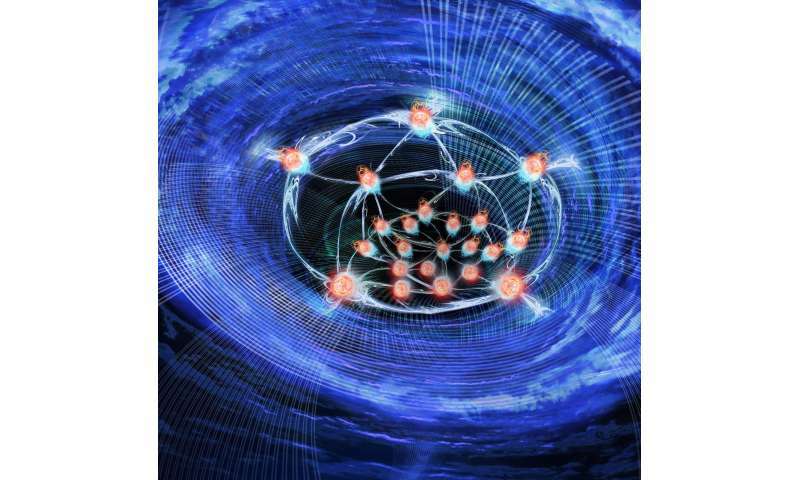 The unique properties of magnetic atoms permitted to suppress regular interactions up to a degree that quantum correlations became the driving force. With her team Ferlaino has been able to prove that quantum fluctuations leads to an effective repulsion of particles that provides the necessary surface tension to stabilize a quantum droplet against collapse. "In our experiment we have, for the first time, realized a controlled crossover from a Bose-Einstein condensate, which behaves like a superfluid gas, into a single giant liquid-like quantum droplet of 20,000 atoms," explains experimental physicist and first author of the study Lauriane Chomaz. Thanks to exquisite control of the interatomic interactions in the experiment, the physicists were able to conclusively prove the importance of quantum fluctuations by comparing their experimental data with the theory developed by Luis Santos's research group at the University of Hanover.